She has helped uncover the forgotten works of suppressed composers and played alongside the likes of the National Orchestra of Taiwan and the Moody Blues. 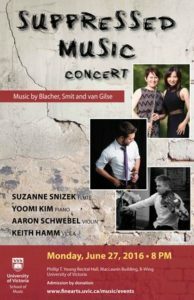 Now, the research and creative practice of School of Music flute professor and music scholar Suzanne Snizek is receiving renewed attention with the news that she is among the 10 recipients of UVic’s inaugural REACH Awards. Combining the Teaching Excellence Awards with the Craigdarroch Research Awards, the REACH Awards celebrate the extraordinary teachers and researchers who lead the way in dynamic learning and make a vital impact at UVic, in the classroom and beyond. Snizek, who received the Award for Excellence in Artistic Expression on May 25 at an evening ceremony at the Royal British Columbia Museum, is an expert in “suppressed music” — classical music silenced under the Nazi regime because of the composers’ ideologies, aesthetic or Jewish heritage. Many of these works are exceptional, but are rarely performed to this day. You can listen to some samples of Snizek playing suppressed music here. Indeed, Snizek has dedicated much of her academic career to bringing this suppressed music back to life. Through audio recordings, publications, performances and lectures around the world, she’s part of a global effort to bring these forgotten treasures back into our musical and historical consciousness, and to remind us what can happen when the rights to free speech and artistic expression are violated. Snizek’s research was originally inspired by the illegal detentions at Guantanamo Bay in the early 2000s. “The inherent cruelty and injustice of ‘indefinite detention’ has always been particularly unacceptable to me and so was a natural starting point for my research.” Unfortunately, she says she isn’t shocked that issues of personal and artistic suppression are still as relevant today as in the World War II era. Research aside, she has also been pleased with student response to this body of work. While awareness of history and context differs greatly according to the individual — “I had one student who told me he knew nothing about the Holocaust . . . [as well as] participants in UVic’s I-Witness Holocaust Field School” — Snizek says there has been a great deal of interest in discovering a previously unknown potential repertoire. 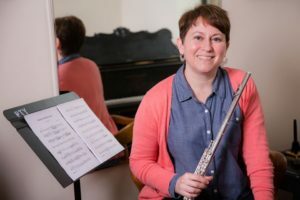 As both a flute performer and music scholar, she says there’s no denying the global impact of a small group of people can make with this kind of work. “There is growing interest in ‘recovering’ these composers, and attitudes have markedly improved even since 2005. People are far more aware now,” she says. Learn more about Snizek and her students via her Flute Studio Blog. Most people likely see theatre as a form of entertainment, but for anyone working with global refugees and internally displaced persons, theatre can also offer a sense of hope and community. Consider the global impact of the work of UVic applied theatre PhD student Taiwo O. Afolabi. 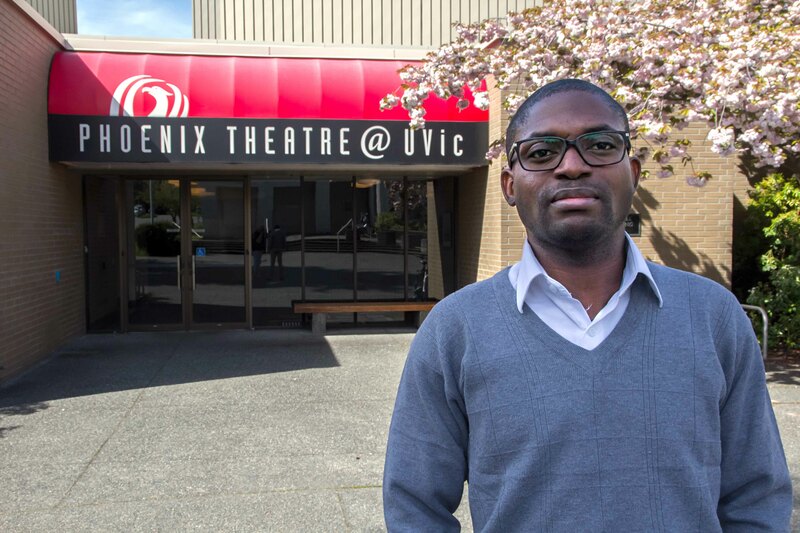 A graduate fellow with UVic’s Centre for Global Studies and a Queen Elizabeth Scholar with UVic’s Centre for Asia-Pacific Initiatives, Afolabi arrived in Canada two years ago. His research focuses on artistic practices among internally displaced persons (IDPs) in IDP communities or camps to create awareness for the plight of displaced persons. 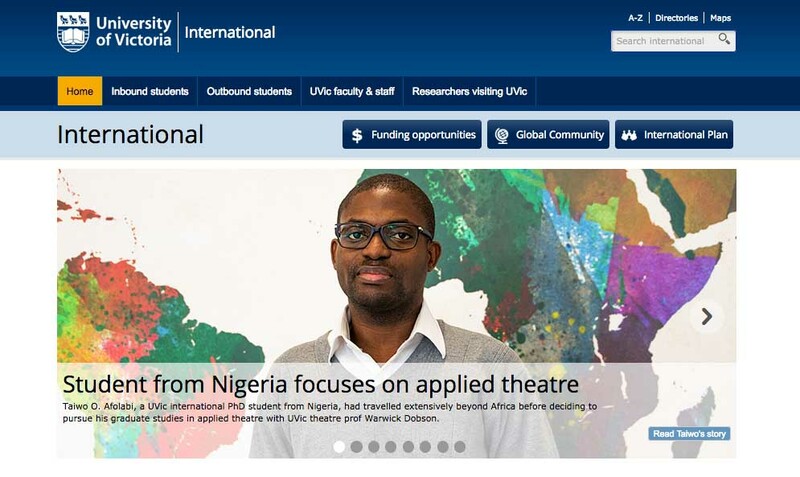 The Nigerian-born scholar had already travelled to the likes of Burkina Faso, China, Denmark, Iran and the USA and before choosing to pursue doctoral studies in UVic’s Theatre department; indeed, he came to UVic specifically to study with renowned Department of Theatre professor Warwick Dobson. The applied theatre program in the Department of Theatre is no stranger to international projects: consider the recent field school to India led by PhD candidate Matthew Gusul, or the efforts of Theatre professor Kirsten Sadeghi-Yekta, who has led projects in Brazil, Cambodia, Nicaragua and The Netherlands. Locally, Afolabi has been working with both the Victoria Immigrant and Refugee Centre Society and the Intercultural Association of Greater Victoria, and will be participating in a World Refugee Day performance at Victoria City Hall on June 20. Following completion of his PhD, Afolabi hopes to travel to throughout Africa — specifically to Eastern, Southern and Western Africa — to map and document what local people are doing to preserve their culture. “Moving from different countries gives you a broader perspective on the world and practices,” he says. Afolabi is participating in a panel about migration and refugee performances as part of Forgotten Corridors: Global Displacement and the Politics of Engagement — the 10th annual conference of the Canadian Association for Refugee and Forced Migration Studies. Running May 15 to 18 and hosted by UVic’s Centre for Asia Pacific Initiatives (CAPI), this is the first time the conference has been held on the west coast of Canada. “We’re building community and building relationships between refugees from different cultural backgrounds,” Afolabi said in this Times Colonist article about the Forgotten Corridors conference. Afolabi explains that he uses dance, music and drama to give displaced people a sense of empowerment and allow them to engage in “self-celebration, self-expression and self-documentation,” rather than simply being treated like victims. 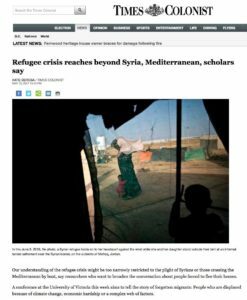 Forgotten Corridors seeks to expand the examination of global displacement by looking beyond the world media focus on the Mediterranean: are other displaced groups being left out of the discussion? How do financially strapped countries such as India and Kenya accommodate thousands of guests for protracted periods of time? What can theatre teach us about the experiences of internally displaced persons? What do Australia’s offshore detention camps reveal about personal impacts of sending those in search of a safe home to languish in limbo? By bringing together more than 200 activists, scholars, policy makers and other experts from all corners of the world to share knowledge, experiences and strategies as they relate to global displacement, Forgotten Corridors also dovetails with UVic’s new International Plan, launched in the fall of 2016. It is also one of four signature series events by UVic to mark Canada’s 150th anniversary. For his part, Afolabi hopes to start conversations at Forgotten Corridors that will act as “sparks” for people to then take home with them. From the underground to the mainstream, Intrepid Theatre’s annual UNO Fest is a hotbed of contemporary solo theatre and performance. Originally launched by Theatre alumna Janet Munsil in the basement of Victoria’s Bedford Hotel in 1997, UNO Fest is celebrating 20 years of daring stories and acclaimed artists — and this year’s 11-day festival will once again feature a number of Fine Arts alumni, as well as one current student. North America’s longest running festival of solo performance, UNO Fest has presented more than 330 solo shows over the past 20 years, and is proud to bring some of the country’s — and the world’s — most innovative solo talents to Victoria every May. From parties to soundscapes, from performance art to a salsa lesson, UNO is packed to the brim with genre-defying, boundary-pushing solo performance. UNO Fest runs May 17 to 27 at various downtown venues. Tickets range from $18 to $30, with tickets and various mult-show pass options available through Ticket Rocket. And the opening night performance of every show at the festival is Pay-What-You-Can for tickets at the door, with 25% of the theatre’s capacity held for PWYC tickets. 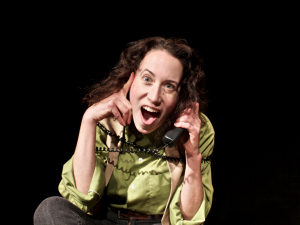 Part confessional, part story, part show-and-tell, After the Beep uses forgotten voice recordings from Pamela Bethel’s teenage “private” phone line. Instead of erasing the messages, she’s sharing them, 25 years later with a live audience. It’s like The Breakfast Club meets the Watergate tapes . . . in 1990’s Vancouver. When do we become adults? What forges us into the grownups we become? What are the accidental rites of passage for teenagers of the Western First World? After the Beep explores the secret languages of adolescence and memory. It delves into the messiness of this in-between period of life that shapes all adults but that many of us would prefer to keep off the record. Pamela Bethel is a writer, director, photographer, creative collaborator and former stage manager, who is also a childbirth educator and birth & postpartum doula. She recently toured as a core artist with Theatre SKAM’s Fashion Machine in the UK, was assistant director for 2016’s The Winter’s Tale at the Greater Victoria Shakespeare Festival, recently co-wrote/directed/built a show called Anxiety for Edmonton’s Theatre Yes — a “pan-Canadian, immersive performance-installation piece” — and also serves on the board of local Impulse Theatre. After the Beep runs May 18 – May 19 at Intrepid Theatre Club, and is presented by celebrated Phoenix alumni company Theatre SKAM, whose artistic producer is Theatre alum Matthew Payne — who, in addition to being Pamela’s husband, was also director of the recent Phoenix play A Queer Trial. Punctuated with music tracks and manipulated sounds created live on stage, Fringe legend, master monologist and celebrated Phoenix alum TJ Dawe returns to UNO Fest with Burn Job, a story about growing up, blowing things up, LSD and a breathing technique that brings you into a psychedelic state. TJ Dawe is a Vancouver-based writer, director, performer and dramaturg, mostly of one-person shows. He’s participated in the Montreal Just for Laughs Festival, the Edinburgh Fringe, the Adelaide Fringe, the Charleston Piccolo Spoleto Festival, five times at UNO Fest and 106 fringe festivals. He co-created and directed the famed The One Man Star Wars Trilogy — written by and starring fellow Phoenix alum Charlie Ross, with whom he also appeared at Phoenix’s 2016 Spotlight on Alumni. (Dawe and Ross are currently working on a One Man Stranger Things.) He has a number of published scripts and his show Medicine can be viewed on YouTube in its entirety. 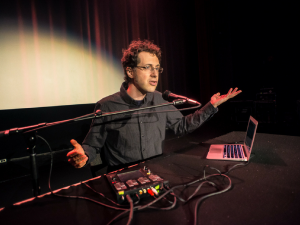 He teaches a course on creating solo shows at Langara College in Vancouver. He leads workshops on creativity and the personality types of the Enneagram. He can be seen rehearsing (also known as wandering around mumbling to himself) in Stanley Park. Burn Job runs May 26 – May 27 at Metro Studio Theatre. With The Secrets of Naming Clouds, recent Visual Arts MFA Kerri Flannigan offers a performance accompanied by moving image work, projections, sound and live-narration. Flannigan’s creation draws on utopic universal languages such as Blissymbols — an “anti-word” language designed to eradicate miscommunication — and Láadan, a feminist language created to end patriarchy. These idealized forms of communication are interwoven with coming of age stories; home videos and choreographed dances, dating bans, classroom conversations on consent, teen-girl vigilantes and a family trip to LA in pursuit of minor celebrity Adam Sessler, Kerri’s sister’s crush. To get a feel for the show, watch this video trailer. Primarily working in video and performance, Flannigan’s work comprises an interdisciplinary approach to forms of experimental narrative and documentary. Her recent work has explored themes such as family mythologies, coming-of-age confessions, body language and swimming pools. She has shown locally and internationally, receiving a CALQ Multidisciplinary Arts Grant (2011) and Best English Zine at the Expozine Awards (2011 and 2014) and runner-up to the inaugural Lind Prize (2016). 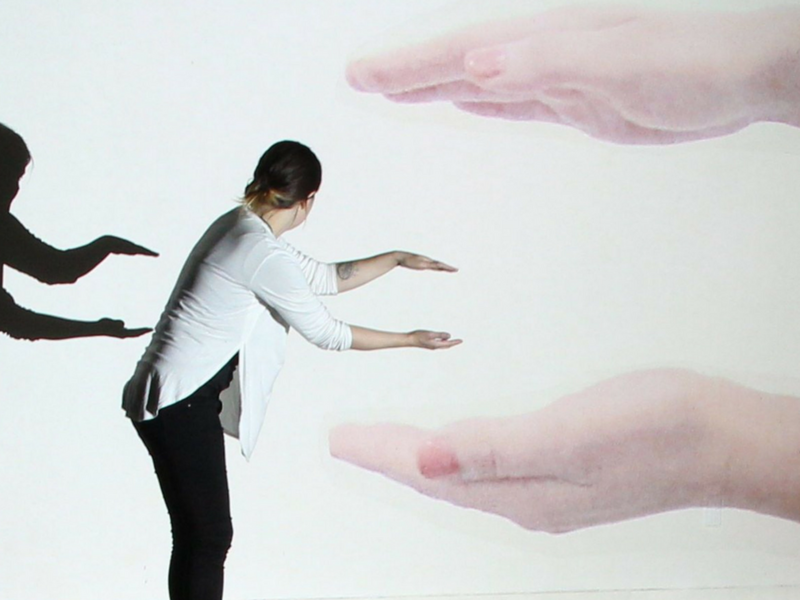 She is currently developing a new video-based performance work, Blue Crush, which will premiere in Victoria in the summer of 2017, and is an upcoming Artist-in-Residence at Open Space. The Secrets of Naming Clouds runs May 25 – 27 at the Intrepid Theatre Club. Local creative support for this show comes from Visual Arts professor Megan Dickie, with direction by Writing professor and acclaimed playwright/director Kevin Kerr, co-founder of Vancouver’s acclaimed Electric Company Theatre. 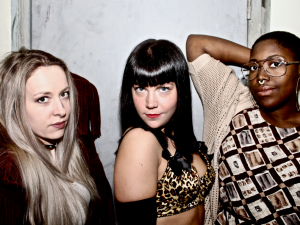 UNO Works is an evening of three short new works by some of Victoria’s most daring female artists, including current Writing/Theatre student Ann-Bernice Thomas, who was also the 2016 City of Victoria Youth Poet Laureate, as well as an accomplished spoken word artist, activist and actor. She’ll be appearing alongside local talents Eddi Wilson (AKA drag king/performance artist Eddi Licious) and actor/playwright Sarah Murphy. Commissioned specifically for UNO Fest, UNO Works is artist-driven. There is no formula for making new work for the stage and we invite you to come and witness the thrill ride that is intrepid artists from diverse, interdisciplinary backgrounds redefining what theatre is. UNO Works runs May 21 at Metro Studio Theatre. There’s also the annual late-night festival party and spoken word battle Monobrow. UNO Fest’s signature 3-minute monologue slam, Monobrow brings local talent and festival performers together in a competitive throw-down cabaret of honest truths, blatant lies and elegant fictions. This year’s Monobrow competitors include Ann-Bernice Thomas as well as Theatre grad Jennifer Braem and Writing alumni Melissa Taylor and Kat Taddei, alongside four other daring artists. Monobrow runs May 19 at the Intrepid Theatre Club. Admission by donation, the bar will be open, and all proceeds benefit the Megan Newton Scholarship Fund — named for the late Theatre alumna and much-loved Intrepid Theatre employee Megan Newton, whose life was cut short by melanoma in 2012, shortly after her 30th birthday. Finally, UNO Fest kicks off on May 17 with WTF? (or What’s Theatre For?) by acclaimed theatre artist Daniel MacIvor, who was commissioned to write the world premiere of Inside specifically for Phoenix Theatre. With WTF?, MacIvor takes us on a journey through his personal and professional life to help us (and him) understand the accident of intention, the profundity of the random, and the wisdom of not knowing. WTF? is a keynote talk commissioned specifically for the 20th annual UNO Fest.